Due to the evidence of systematic animal abuse uncovered in our Free Range investigations the RSPCA has been forced to drop its fraudulent endorsement of Otway Pork products and remove its Paw of Approval from the brand. The endorsement was underhandedly withdrawn in July this year, 14 months after our shocking investigations began into RSPCA approved free range bred piggeries. Otway Pork was the RSPCA’s spearhead brand for many years and promoted at such events as the Million Paws Walk and in RSPCA promotional videos. A blog still on the RSPCA website states “The RSPCA is very proud of our ongoing relationship with Otway Bred Free Range Pork – where animal welfare is an integral part of their business”. This withdrawal raises more questions than it answers, and further highlights the deception being carried out by the RSPCA. We know the RSPCA first saw our horrific footage of the piggery in December last year. We know Otway Pork had an RSPCA inspection in January of this year. Why then did it take another seven months to withdraw the Paw of Approval? The answer is obvious, Otway Pork NEVER operated at the standard the Paw of Approval Scheme claims to demand, and it is only the fact that we have exposed the fraud that the RSPCA has been forced to act. The RSPCA are saying that some of the footage in our video is of no longer endorsed farms. But all footage taken in the video was taken at farms that were accredited by the RSPCA at the time. Here are the facts about RSPCA deception. The RSPCA removed their endorsement of Otway Pork over half a year after they were shown video of the horrific animal cruelty they were endorsing. In that half year period ALV continued to document atrocities at RSPCA Approved Otway Pork farms. 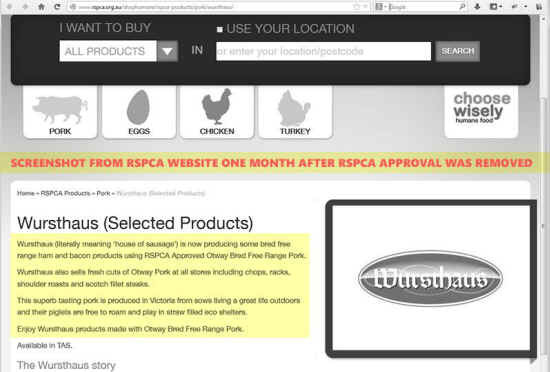 One month after the RSPCA removed their Paw of Approval from Otway Pork the RSPCA website is still promoting “RSPCA Approved Otway Bred Free Range Pork”. Customers continue to be deceived. Otway Pork products are to this day being sold with the Paw of Approval from butcher shops, one month after the endorsement was withdrawn. 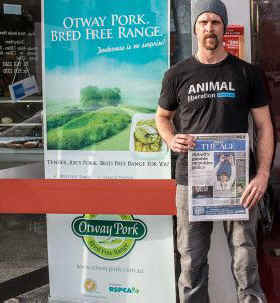 Butcher shops we spoke to that displayed Otway Pork promotional material with the RSPCA Approved logo were unaware the brand was no longer endorsed. 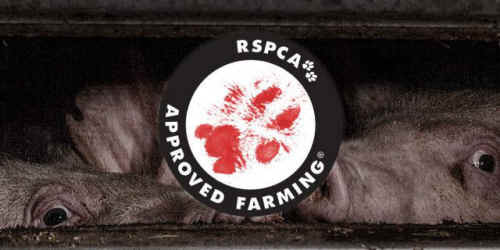 The RSPCA refuse to provide information about their other RSPCA Approved farms. If the RSPCA has nothing to hide they would be fully open about who is raising and killing animals with their “paw of approval”. The fact they will not, and the fact that they were endorsing such terrible animal abuse at their spearhead brand, is a tragedy for the animals they are supposed to be protecting. If the RSPCA is to regain any credibility it must drop the Approved Farming Scheme immediately and get out of business with animal abusers.